I Used to be a Midget but I grew out of it. The graph below illustrates how bitty this month has been overall. It also provides hard evidence that we aren’t doing as badly as you might imagine. We have a snow depth of 97cm recorded at Spencer’s Creek which has been steadily building through the month. ENSO and the IOD. Cruising Along in Neutral. Not much has changed since the last update regarding the two biggest climate drivers – El ENSO and the IOD. ENSO is still running neutral and this isn’t going to change for the rest of the winter. We would expect a neutral winter to give us slightly more snow than either a La Nina or El Nino year but this winter isn’t shaping up that way. Sometimes Mother Nature just doesn’t like to play ball! The IOD is also neutral. The IO- What? I hear you say. The IOD measures the difference in sea surface temperatures (SSTs) between the Western Indian Ocean and the Eastern Indian Ocean around Indonesia. In its positive phase, colder than average water collects in the Eastern Indian Ocean which means that South Australia is likely to experience drier than average conditions. I know, it’s a complicated World we live in. Multiple international climate models forecast the future state of the IOD. The consensus is that the IOD will remain neutral until the end of the season. It is difficult to pinpoint exactly why high pressure has been hanging around like a bad smell for most of the season so far. One theory is that warmer than average SSTs in the Pacific and Indian oceans are to blame. One thing is for sure, it is a pattern that we haven’t been able to shake off. Climate models indicate that the subtropical ridge (band of high pressure systems) is likely to sit to the south of Australia into spring despite the neutral ENSO and IOD. This will give us sunnier and drier than average conditions. For all you stargazers and snowmakers out there this is good news as we will continue to get a number of cold nights under those starry skies. You can take a horse to water but you can’t make it drink…Another theory is that North Korea has launched weather changing missiles over the Aussie Alps which keep fronts away with the aim of driving the local population apes**t but that’s just fake news. In fact, the SAM index turned negative for a large part of July but this didn’t translate into bumper snowfall. I don’t want to rub salt into the wound but other parts of the Southern Hemisphere did manage get significant cold weather outbreaks and decent snow. On the weekend of the 15th July a strong cold front moved across Chile giving snow all the way down to the capital, Santiago. 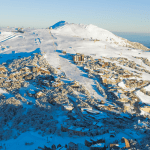 Valle Nevado boasts a snow depth of 250cm and I’m sure we have all seen the pictures of the epic snow which has fallen in The Canterbury High Country in New Zealand. 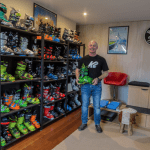 Mount Hutt has a base of 270cm…ahem! This illustrates that snowstorms are a hit and miss affair. We can try to describe the probability of an above average or below average season as best possible using things like El Nino as a guide but when push comes to shove natural variability and inherent climate system chaos is more significant. This is especially true when all the major climatic drivers are in neutral mode. I do have some good news for you. We have a decent chance of a big storm rolling through from the 5-7 August. The zone of high pressure which has been plaguing us will finally bugger off into Western Australia clearing the way for a low to track towards Tasmania. This system should drop between 30-60 cm of snow on most resorts down to 1500m. This will go a big way towards boosting conditions. It is still a long way so confidence is low but the models are already hinting at another couple of systems moving through around mid-month. Let’s be clear. August is traditionally the snowiest month in the Aussie Alps so I still expect to see our base build over the coming month – plenty of systems will roll in despite the tendency for higher than normal pressure to the south of the country. We are currently running with a below average snow depth for the time of the year. That said, conditions are OK on mountain. If we get lucky and a couple of those big snowstorms forecast do materialise then we will be laughing. We already have one forecast for the first weekend of August. If another one rolls up mid-month then we will end up with an average year. Reaching the long-term median peak snow depth of 176cm is definitely possible – something that we wouldn’t have said at the start of July. The exceptionally low snow depths registered at the start of last month made me shave the peak snow depth forecast back to 150cm on my last update. We are now at 97.8 cm at the end of this month though it’s been a bit of a blur as to how we got there. I think that we will easily hit or surpass the 150 cm mark by the end of August or start of September. In fact, it is likely that we will end up with a bit more than 150cm. I am going to revise the peak depth forecast back up to 160cm. However, I am quietly optimistic that we will end up with close to average conditions this year but I want to manage expectations. Whatever the case, I hope to see you up on the mountains this month. Conditions are steadily improving. This season is maturing like a fine wine. Don’t be a lazy so and so. It’s time to get up of the sofa, to leave the internet World and get those ski legs pumping while you still can!